Meanwhile Gill finds the Marina del Mar, which is a giant ship. He freezes the water and the ship, and kills the majority of the crew. Simmons’ boss tells her that she is wanted upstairs for questioning. She has no idea what she has done, but her boss knows it’s not a good sign. She is escorted by two large men, and is questioned by Bakshi. He wants to know what her involvement was with Gill in the past. She says that she helped him once, but barely knows him. He makes her pledge her loyalty to Hydra, and wants her to help them capture Gill. Fitz is left alone with Mack while the others try to find Gill before Hydra does. “Simmons” helps convince Fitz to go down to Vault D to see what the big secret is. He finds Ward, and freaks out. Fitz turns off the oxygen, making Ward feel what he felt when Ward left him to die. When Ward hears that the others went after Gill, he tells Fitz they are in great danger. S.H.I.E.L.D. tracks Gill to the ship, but Hydra is already there. Bakshi is in Simmons’ ear telling her what to say to Gill. It turns out that Gill had already been taken in by Hydra in the past, and the words that Simmons is saying to Gill are the trigger to turn him back to Hydra. May realizes that Simmons is the one with Gill, and shoots Hunter so he won’t kill Simmons. It’s also payback for Hunter shooting her a couple of episodes ago. 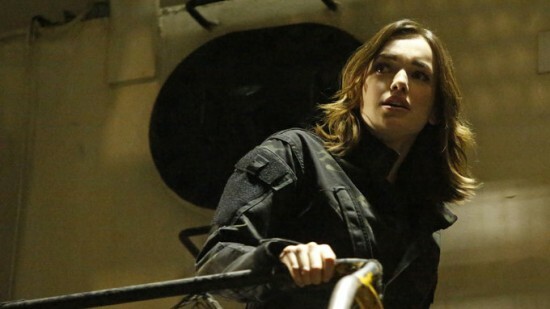 Coulson is in the jet, and tells May to protect Simmons cover. They are to get the target (Gill) or destroy it. Bakshi triggers the brainwashing on Gill, and turns into, a cold, calculating, machine of a man. Bakshi tells him not to let anyone off the boat alive. Gill freezes the exit door, and begins freezing the entire ship. May and Hunter are trapped inside, but Skye shoots Gill and he fall overboard into the ice. Bakshi and Simmons escape, and S.H.I.E.L.D. ends up with a bunch of Hydra gear. Skye is scared for Simmons, but May assures her that Simmons can handle it. Back in Whitehall’s office, “Agent 33” hands him some paperwork, confirming that has been broken. Bakshi tells Whitehall that Simmons is very talented and should be working upstairs with them. Whitehall is leery, but Bakshi tells him she is loyal to Hydra. And if she isn’t, then they will make her comply. Skye is talking to Ward in Vault D, and Ward tells her that he was never brainwashed. He did everything on his own. But he was loyal to Garrett, not Hydra. He also tells Skye that her father is alive and looking for her. He hopes that maybe someday he can take her to him. Skye leaves, and checks her heartbeat, which is soaring.